While cultural critic Gary Moskowitz makes some interesting and valid points in his "Why There Won't Be a Fourth Wave of Ska" blog posting (I've copied it below), I don't buy his argument--ska may never again come close to breaking into the mainstream pop culture as it did in the 90s, but it won't be for the reasons he states. As Dave Wakeling points out, the political and economic climate in the US over the past several years does echo that of Thatcherite Britain, which would seem to create a favorable environment for ska bands that offer socially aware commentary--and helped propel many of the 2 Tone era acts onto the charts (but notice how he fails to mention any of the extraordinarily powerful protest songs by The Beat and The Specials, such as "Stand Down Margaret," "Get a Job," "Ghost Town," "Too Much Too Young," or "Nelson Mandela," by focusing almost exclusively on Madness' "party music" instead?). Unfortunately, the great tradition of organized protest and resistance against injustice (very much alive in the UK in the late 70s--see the Rock Against Racism concerts or the CND) just isn't happening here (if we didn't rise up and storm the White House when the Bush Administration failed to stop 9/11 and then lied about Iraq's connection to it in order to launch a war; couldn't be bothered with tracking down and bringing Osama bin Laden to justice; broke domestic and international law by torturing POWs; engaged in massive, illegal spying on American citizens; corrupted the Justice Department for political gain, etc., etc.--what exactly will it take for us to band together as citizens and say we've had enough?). It's just not in the DNA of our technologically distracted and self-absorbed youth culture (nor was it part of mine, I'm sad to say, as many of us turned out to be Alex Keatons). I love ska's rich history of decrying social and political injustice--much of which continues to this day--but I don't think that it's a prerequisite for the music's re-emergence from the underground, since there's not much of a public appetite for protest music (apart from Green Day's broadside against Bush's reign in American Idiot). Having said that, ska music certainly has the potential to be a vital part of pop culture in the US--and should continue its proud tradition of being a voice for the oppressed and forgotten. No, what will keep the fourth wave from rising are obstacles more like the music press' and the music industry's viewpoint that ska--2 Tone, 3rd wave, whatever you call what is happening now--is simply a revival genre (no doubt some of this came about because all of the major 2 Tone acts covered many 60s ska hits in their day), rather than a style of music that has been continuously and organically evolving since its creation. As long as the revival label sticks, contemporary ska bands will always be considered to be musicians practicing a somewhat illegitimate or lesser art and dismissed as such. (It also doesn't help that The Specials are still cashing in on their wave of nostalgia instead of spearheading a new ska movement...) Punk managed to avoid being branded a revival, despite Green Day's massive debt to The Buzzcocks and Undertones and Rancid's obsessive Clash-love, by having the good fortune to have been repackaged in plaid in the 90s as grunge. A much larger problem facing the ska scene (and bands in general) is how to make one's music and message heard above the extraordinary din of our decentralized, highly segmented pop culture media, with its infinite number of choices all vying for one's attention. Alternative commercial radio is dead (killed by internet radio, satellite radio, iTunes, iPods, Pandora, illegal file-sharing, podcasting, and the lowest common denominator pre-programmed blandness resulting from massive corporate ownership of the airwaves). Likewise, printed publications are wasting away (circulations and advertising revenue are way down--I've been horrified watching The New York Times shriveling before my eyes--as many people have turned to the web for free, instant information from a plethora of sources). There are very few mediums left that consistently reach a large audience (why else would No Doubt be appearing on the awful "American Idol" or hawking themselves on "The Today Show" along with the latest diet craze author?). It all makes you wonder if the whole 2 Tone scene had taken place in a post-internet age, would anyone have noticed (or cared)? A recent reunion performance in London by the 2-Tone ska band Madness made me think that the time is a ripe for a massive ska revival. Unfortunately, the chances of seeing one are unlikely. Ska music--the brassy, jazzy, up-tempo precursor to reggae--is a mixture of American rhythm & blues, Caribbean calypso and Jamaican folk music that evolved in the late 1950s and early 1960s, as Jamaica was gaining its independence from Britain. While celebratory and made for dancing, the music was inherently political. Studio One song titles like “I Want Justice,” “Forward March” and “Freedom Sounds” were typical. As ska music evolved into rock steady and then reggae, such identity politics became even more pronounced. Fast-forward to the late 1970s and early 80s, when a steamy political climate brought about not only punk rock, but a multi-ethnic ska revival in Britain and America. The London-based band Madness was part of it, although their music was largely devoid of politics. Madness was basically a party band. They made music to drink to. “One Step Beyond”, one of their biggest hits (later featured on MTV), is basically a repetitious ska romp that revolves around one sax hook. It’s incredibly infectious, but doesn’t really go anywhere. In 1981 Rolling Stone described them as “little more than the Blues Brothers with English accents.” For better or worse, most ska bands that emerged during the “third wave” of ska in the 1990s followed Madness’ lead. Things haven’t changed, if their recent performance of a few new songs at London’s HMV music store is any indication. Madness sounded good, and they were clearly enjoying themselves, but there wasn’t exactly a tidal wave of energy surging through the mostly over-40 crowd. The Specials, the 2-Tone label’s flagship band, recently played a couple of sold-out reunion shows in London, and The Beat (the name the English beat goes by Britain) has played shows recently as well. While all of these shows got some favourable press, I haven’t heard much buzz about them since. An upcoming “30 Years of 2 Tone” show in London on July 18th will surely do its best to rally the troops. Ska has repeatedly risen to near-mass appeal and then fallen back into obscurity. It held on in Jamaica for about six years before the popularity of rock steady and reggae dwarfed it. The British 2-Tone movement lasted about five years. A few American bands pushed ska in the 1980s (The Toasters, Fishbone), and the American-focused third wave of the 1990s had largely faded by the end of the decade. Madness, like so many other bands, grew tired of ska and started writing more pop-influenced music. No Doubt, a popular third-wave band, did the same thing. It's a nice idea, but I don't see it happening. Despite big pockets of ska fans around the world, mass audiences don't seem to want it. It’s always been a niche music. Even a vast economic downturn won’t change that. After Madness’ set, I couldn’t help but think about a couple of Skatalites shows I saw in the mid-'90s. Jamaica’s original “house band”, they were amazing even in old age. The songs weren’t jittery, trebly, high-voltage affairs. The music was seductive, sublime, jazzy, smooth and bass-heavy, with occasional moments of virtuosity in the horn solos. Decades of history, politics, melancholy and humour came through in every note. It's the sound that inspires devotion among ska's followers, and not an easy one to replicate. British pop-ska band Madness has been making records and touring for three decades, so it’s amazing that the band is known for exactly three songs on this side of the Atlantic: the bouncy ska number “One Step Beyond,” the treacly pop smash “Our House” and the witty “House of Fun,” which remains unsurpassed as a cautionary lesson in how not to buy prophylactics. They’re fun, karaoke-ready numbers, but they don’t even begin to reveal the full strength of the band’s songwriting—a gift that has apparently kept on giving judging from The Liberty of Norton Folgate, the band’s ninth studio album (and first collection of original material since 1999). Improbably for a band that’s been playing and recording for as long as Madness, Folgate is a fresh, energetic and audacious pop record, lush in sound and thoughtful in manner. One of the best songs of the set, “NW5,” neatly demonstrates everything Madness does really well: the way the band builds songs on Mike Barson’s insistent keyboard jabs, the arm-around-your-shoulder way in which singer Suggs delivers the lyrics and the swoony string arrangements and horn charts that take Madness’ music from the two-tone to the kaleidoscopic. There are so many legitimately great songs on Folgate—the swaggering hometown anthem “We Are London,” the perfectly preserved ska throwback “Forever Young” and the epic, Kinks-like title track among them—that the record could easily hold its own against the band’s last greatest-hits compilation. It’s that familiar, and that good. Fanboy sidebar: Earlier this week in the mail I received the 10", 7", and CD singles of "Dust Devil" (with its various remixes) that I had ordered (all for five pounds) from the Madshop in the UK. The packaging on the vinyl is particularly cool and old school (see the 10" above)--a nice addition to the record collection. Even though I'm jonesing for the new album, I think I'll wait for the domestic Yep Roc version to be released on July 7th (even though I want it now). Here's a bit of news that might suggest that The Specials will be launching a world tour this summer. According to Stuff.co.nz, the band will be doing a one-off gig in Auckland on August 1st. Happy birthday to the magnificent Prince Buster, who turns 71 today! And I can't believe that I missed Laurel Aitken's birthday back on April 22! (My day job completely consumed my life that week, actually.) He would have been 82 years young. Soon, I'll have more on the slew of LA re-issues that are just now seeing the light of day. The Porkers first came to the attention of the global ska scene in 1989 when they appeared on the Ska for Ska's Sake compilation (on Link Records), though they were then known by the naughty moniker The Pork Hunts (say it quickly a few times and you'll be in on the joke)--something that became a bit of impediment with club owners, so they switched to The Porkers (which is kind of a double entendre itself). Since then, The Porkers have persevered at perfecting their super hi-NRG, turn-it-up-to-eleven brand of ska, fueled by meaty doses of punk, rock, and metal, and placing them in the category of such hyphenated ska bands as Fishbone (ska-rock-funk-metal-kitchen sink), Skankin' Pickle (ska-funk-rasta-punk), and The Mighty Mighty Bosstones (ska-core). (Here is where I cop to not being a huge fan of ska-core, so buyer beware.) The band is big in its native Australia (they've played stadium tours with No Doubt, Rancid, etc.) and has made significant inroads in the USA, including two albums released on Moon (Grunt in 1995 and Hot Dog Daiquiri in 1998) and a coveted spot on the 1999 Vans Warped Tour. Yet, after the collapse of the US ska scene at the turn of the century, the band seemed to fall off the US ska radar scope--so it's good to find them still kicking and in such terrific shape all these years later. The release of This is The Porkers--which marked the band's twentieth anniversary--serves as a decent introduction to the band (or reminds one of their proper place in the ska pantheon), as about half of the tracks are some of The Porkers' top-shelf (and re-mastered) songs from Hot Dog Daiquiri, Time Will Tell (2000), and Now Hear This (2004). Of the new material, the stand-out cuts include the Highlife-tinged "Sangria" ("You're sweet, and so fruity/And you prove so good for I"); "Dread Man Walking," a reggae-ish stomp which ponders the back story of one of the zombie-like homeless men roaming the streets of their hometown; "Deep Vein Trombosis," a hard-driving, horn-heavy, post-2 Tone instrumental that wouldn't be out of place on No Sports' King Ska album; and the straight-up and almost sedate jazzy ska of "Waiting for Us." While I was familiar with some of the band's pre-Y2K songs ("Aporkalypso," "Skankin' Carpark Blues"), I'm pleased to now be acquainted with the excellent, Fishbone-esque "Too Big for Your Boots" and the bold, horn-filled "Swinging Like Tiger Woods" (if you didn't know this was The Porkers, you'd swear it was a Dub 56-era Toasters song)--with the boastful lyric "I'm not content to be number one, but the best that's ever been!/And now it's time for me to come up with the goods/So I'm swinging like Tiger Woods!" The Porkers aren't out to change the world--look elsewhere for your dose of righteous social commentary--but they do know how to write catchy melodies and play the hell out of them in order to make you dance. Just wanted to let you all know that I'm going to be out of town, away from all computers, for a few days, so don't expect new Duff Guide to Ska content for a few days. However, in the near future, I'll be writing up reviews of new The Porkers' CD, several Do the Dog releases, and posting info about some amazing Laurel Aitken reissues. According to Top40-Charts.com (see below), Madness' new album The Liberty of Norton Folgate will be released in the USA on...wait for it...Yep Roc Records!?! Recently called "great giants of British music" by BBC late night host Jools Holland, 2 Tone/Second Wave ska invasionists Madness have waited nearly a decade to offer the world new songs. On August 18th [according to the label's website, the album will be released in the US on July 7, but will be available digitally on June 23] Yep Roc Records offers the answer, The Liberty of Norton Folgate. Formed in the fertile underground of 1976 London (along with contemporaries The Specials), Madness is a seven man musical army hell bent on capturing the colorful influences of the people and cultures of their beloved city. Their dedication to the exploration of musical London as well as countless UK top ten singles/albums have garnered the band household name status in Britain, making the album one of the most anticipated releases of the year in their home country. Described by the band as an "audio guide to the greatest city on earth" and Madness' unique take on the concept album, The Liberty of Norton Folgate moves between elements of burlesque jazz, rock, ska and even polka combining for an effortless lesson in pop song craft. An area outside the city walls of the old city of London, Norton Folgate was one of several original 'liberties' independent of the bureaucracy of the main city government. Founding member Graham McPherson (aka Suggs) describes the area as, "a refuge for actors, writers, thinkers, louts, lowlifes and libertines - outsiders and troublemakers all. Sounds like our kind of place does it not?!" Suggs continues, "We'd been kicking around the idea of a concept album about London for a while. We wanted to get the x-ray camera out and shoot down through the crust, past the bullets and bones, the clay pipes and stones, to try and get to the soul of the place. We're all dancing in the moonlight, we're all on borrowed ground." The spirit of the place that would later become Whitechapel, the hunting ground of Jack the Ripper, stalks this album and reestablishes Madness as distinguished statesmen of pop, a vital force influencing yet another generation of musical groundbreakers. I know, I should be grateful to Yep Roc that The Liberty of Norton Folgate is even receiving a domestic release here in the first place, right? Especially during these demon days, what with most of the music industry crashing around our heads. Plus, Yep Roc tends to release vinyl versions of their new releases, so here's hoping this is the case with Madness! If you have a spare $65 burning a hole in your pants, Yep Rock is offering the deluxe box set of The Liberty of Norton Folgate as a pre-order only until June 30th (and the set will not be available after that date). In random kind of Madness-related news, Milwaukee's Invaders (a third wave band formed in the late 80s that shares the name as an early incarnation of Madness) are active again and playing a gig in Madison, WI on May 23rd (to be followed by shows throughout the summer). Who knew? Live music performance has for years been where I have felt the happiest, a state that has existed over three decades of concert going. As we grow older, many of us crave the sweaty intimacy of live music. It is a direct conduit to our misspent pasts. Bands may come and bands may go, but live gigs remain unchanged. The toilets are still too crowded, the beer is still too expensive, the bouncers are still too facey and the music is still too loud. The only change is that the T-shirts appear to have got smaller. But we still love it. So to the opening night of the Specials’ reunion tour in Newcastle. The venue is crammed with a new cultural sub-genre I am calling the Ska Dads — men who in the early Eighties would be found skanking at concerts by Madness, Bad Manners, the Beat, the Selecter, the Bodysnatchers or indeed the Specials themselves. These men have grown in girth and had children over the years. Children whom they want to infect with the same rhythms that transported them in their youth. In the Seventies and Eighties the only place you ever saw dads at gigs was outside, standing next to idling Volvo estates, waiting for their sweaty kids to emerge. Today it is customary to see smiling parents tapping their feet at the back of a gig while the kids all head for the mosh pit, if not to dance then certainly to escape the embarrassing taint of their mum and dad. I myself tried to impose ska on my daughters while driving them to junior school. I would slip a carefully selected compilation disc into the dashboard CD player. As soon as the chant of Phoenix City by Roland Alphonso began, my tiny charges would roll their eyes and moan loudly: “Daaaaaaaad, we don’t like the ska! Put on some Spice Girls!” Matters intensified when I rashly took a box at the Albert Hall for one of the Teenage Cancer Trust gigs where Madness were headlining. My daughters responded to this sledgehammer attempt to impose my musical taste on them by falling asleep during House of Fun. True story. Some of the Ska Dads have realised that when you do get fat and lose your hair then skinhead is a perfect default style. You just have to find enormous Fred Perrys and Ben Shermans, huge Levis Sta-Prest, tassled brogues and you are good to go. Fat, bald, eyeliner-wearing, middle-aged goths simply don’t work — they look too much like Patricia Routledge. Fat mods look simply awkward in suits, a bit like George Osborne. Fat punks resemble characters from a bad Two Ronnies sketch. But a fat skinhead works very nicely. However, some balding, morbidly obese middle-aged men try to pretend that they were always skinheads by watching This Is England and buying a Trojan box set. Even though the only gigs they actually saw in the early Eighties were the Thompson Twins and Billy Ocean. You know who you are. Fortunately, I'm not fat enough (yet) to have to resort to taking on the look of the aging skin...(I write this having just run several miles at the gym--I swear!). Thirty Years into their career, the Nutty Boys write a love letter to London. You can't accuse Madness of overdoing it; this is only their second album of all-new material since 1985's Mad Not Mad. Thankfully it was worth the wait. Named for a corner of the City of London that was legally autonomous until 1900, it's a themed, time-shifting salute to the capital in all of its infinite variety. Using the familiar pop-reggae sound of yore with singer Suggs, in tragi-comedian mood, it energetically represents the band's sombre, complicated side that doesn't always show at the hit-packed live gigs. In these songs marriages fail, things get worse as you get older and joys are fleeting, but it's depth not length that count in time, and ultimately, as on the blissful escape of Africa and the mystic title track's astonishment at a city "sprung up from the dark mud of the Thames," the results are uplifting. 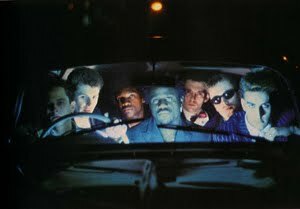 Still totally themselves, Madness have made the album of their career. The Liberty of Norton Folgate will be available as an import in the US on May 19 through Amazon and other fine retailers. All of this kind of makes you wonder what all the fuss is about regarding The Specials "reunion" tour, right? The Nutty Boys at least had the decency to show up for the 30th anniversary festivities with (great) new material in hand. Their EP Armed and Dangerous is a sonic tsunami full of fierce 'n' heavy dub--and definitely worth picking up. The preternaturally prolific Nick Welsh of Skaville UK is a man of constant forward motion. Chief amongst the many new developments to report is the news that Nick is launching his own label, N.1. Records, which will release Back to the Garage, a rock'n'roll record cut with Rhoda Dakar, this May--to be followed by Skaville UK's 3 (their third album, naturally), which will feature horns (there are none on 1973 and Decadent), more Rhoda (yes! ), and see the light of day in August; and yet another Skaville UK album of acoustic cuts titled Parallel Road, to be released in November. Lots of good stuff to look forward to here! 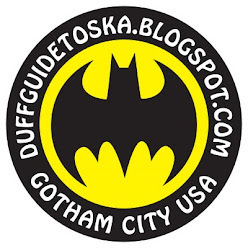 Duff Interview: The Pepper Pots! Joan Verges, the drummer for the extraordinary ska/soul band The Pepper Pots, which is fronted by three terrific female vocalists--Adriana Prunell, Marina Torres, and Merce Munne--recently took the time to do a short e-mail interview with The Duff Guide to Ska, just after the band's tour of Texas, Arizona, and California in support of their second album, Shake It! (on Megalith Records in the USA). For the uninitiated, Shake It! contains a wealth of stellar original ska and rocksteady tunes, including the wonderfully uplifting "Stay on Your Way" (with guest vocals from Dr. Ring Ding), "Lucky Girl," and "Forget the Rules," but the album really shoots sparks when the band cranks up the soul, like on the Motown-y cuts "My Heart Belongs to You" and "I Can Feel It." Really hot stuff. Shake It! also features a reverential cover of The Pioneers' "Starvation" with The Pioneers still sounding great on lead vocals ("One Unity" is the Dr. Ring Ding version of this track), as well as the band's take of The Ronettes "Be My Baby" (Estelle Bennett died at 67 this past February--an article in the New York Times revealed that her post-Ronettes life was marked by struggles with mental illness and homelessness) and Baba Brooks' arrangement of "Duck Soup" with the French ska instrumental band ASPO. The Duff Guide to Ska: How did your first U.S. tour go? Were there any surprises--good or bad? Joan Verges: We are very happy with all the gigs and organizers on this tour. The public received us with open arms everywhere we went and we really enjoyed every show. We are specially grateful to Jeremy from Megalith Records for all the well-done job, he made all the tour run smoothly. DGTS: Which show was your favorite and why? JV: We have good regards from all and each of the US shows, but if we had to mention one or two it must be the SXSW and the Houston one. The SXSW was a big challenge for us, for what it means for us to play in such a big festival and for the audience response. Houston was the first place we played in the US and everything was new and exciting for us. We were surprised when we realise that almost everybody speak Spanish there! It was a very special night, together with the local band Los Skarnales we had an amazing ‘welcome party’. DGTS: What was SXSW like for The Pepper Pots? JV: Well, as I told you before, it was one of the most special events. We had a huge acceptance from the audience. We could only see people and more people from the stage and everyone was dancing, singing and enjoying our music! We really didn’t expect this hit, bearing in mind the size of the festival where is impossible to see more than a 5% of the shows that take place. It’s by far, the biggest fest we have ever played in. DGTS: How would you compare the U.S. ska scene with what is happening right now in Europe and Japan? I think that US is very big and we found different scenes depending on the state where we were. California, for example, has a more classic ska scene, similar to the one you could find in Europe. However, in Texas or Arizona the public seemed more ska-punk, like in Japan. DGTS: Bucket seems to have taken the band under his wing--when and where did you first meet him? Did you just run into him in Spain? Bucket has been into this scene for years. We have coincided several times in some concerts with the Toasters and we knew him for a long time. Besides, he’s living in Valencia (Spain) for years. He and Megalith Records made possible the release of our album “Shake It!” in the US. DGTS: Is there a particular sound or concept your have in mind for your next album, "NOW"? And what has it been like to work with your producer, Binky Griptite? Now! will be quite different from the other two albums. We just follow the natural evolution of the band and it has brought us to Soul. JV: Working with Binky Griptite has been an unforgettable experience. He’s very clear about the “old school” sound and it’s captured in every theme of this new album. We are also recording a “making of” video which includes all the details about the managing and production of this new album from the first day till its release… Something we though had to be seen to understand better this job. A present for all the people that follow us from the beginning and we already consider them our family. DGTS: Since you are doing some of the recording and mixing in New York City, will the band be performing a gig there sometime soon (please)? JV: Last touches of the album and mixes has been done in New York, but it was impossible to play there at the end of the tour, because we had no time enough. We fell in love with this country, we’ll come back, for sure! DGTS: Thanks for taking the time to do this interview! JV: Thank you so much to you. It has been a pleasure. The oppressive heat and humidity that we New Yorkers often have to bear with during the summer (which makes for one stinky city...let's just say we produce a lot of garbage that ferments while waiting for the sanitation trucks--very few kitchens are outfitted with garbage disposals in their sinks--and clearly, we don't have enough public toilets) is offset by the wealth of terrific live music that descends upon us, some of it's even free! Mark your electronic calendars, kids! Friday, May 15 and Saturday, May 16 at 10:00 pm: Dave Wakeling's version of The English Beat at Maxwell’s (in Hoboken, a quick PATH train ride away), $25. Saturday, May 23 at 6:00 pm: Bigger Thomas, Kofi, The Rudie Crew, Across The Aisle, and Animus at Sullivan Hall, $10. 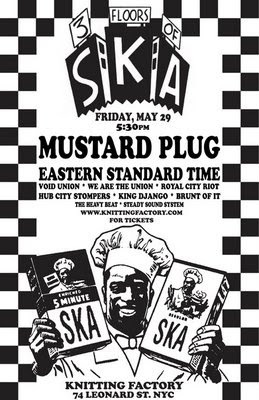 Friday, May 29 at 5:30 pm: 3 Floors of Ska with Mustard Plug, Eastern Standard Time, Void Union, Royal City Riot, the Hub City Stompers, King Django, Brunt of It, The Heavy Beat, Steady Sound System--all at The Knitting Factory (still in Manhattan), advance tickets are $17. Saturday, June 13 at 10:00 pm: The Bluebeats at Shrine (Harlem). Saturday, July 11 at 3:00 pm: Los Fabulosos Cadillacs at Central Park Summerstage (enter Central Park at 72nd and Fifth Avenue), free. Sunday, July 19 at 3:00 pm: Alpha Blondy & The Solar System, Lee “Scratch” Perry & Dubblestandart, and Subatomic Sound System at Central Park Summerstage, free. A pearl of wisdom from Perry's MySpace page: "Piss is a must. Poop is a must." Ain't it the truth, Scratch, ain't it the truth.